I’ve got this really disgusting bruise on my leg … I got a stain on my favorite jacket … I think I might have an ulcer … So, yeah, Hardly Strictly was a success, as always. I elected to skip the first night of the festival this year, in favor of seeing some friends in the East Bay. Friday is usually my favorite day to go, but between the short amount of time I was in the Bay, and the artists I wanted to see being heavily tilted toward the Sunday lineup, it was a sacrifice worth making. I missed Bonnie Raitt, but oh well. I hopped BART from Walnut Creek on Saturday with my good buddy Sam, and we made it to my friend Michelle’s house, near Golden Gate Park, right at noon. We hiked over from there, and fought through an insane crowd to catch a few minutes of the G. Love and Special Sauce set. They’re the very definition of a college band–I Like Cold Beverages just made my feel old–and after they were done we fled to the Porch Stage, where we saw Mike Scott and Steve Wickham of the Waterboys perform a set of songs that seemed to be a 50/50 split between Irish punk and traditional fiddle music. It was excellent, especially their rendition of the classic Will the Circle Be Unbroken. Afterwards we meandered to the huge Banjo stage, where I ran into my buddy Zane, also in town from Brooklyn, in one of those chance encounters that make Hardly Strictly feel like home. We were mostly unenthused by Jerry Douglas’ set–until the last three songs, when he brought out an unbilled Allison Krauss, whose vocals would have blown the roof off the park if the park had a roof. We then watched Steve Earle, generally one of my favorite songwriters, although his set ran a bit heavy toward his new album, which I haven’t heard much of yet. Still, his performance of Galway Girl was a highlight. Sam and I ended up bar-hopping in the Mission after the festival on Friday, an entertaining evening that included eating Pittsburgh-style sandwiches at Giordano Bros., where we saw the Oakland A’s walk off over the Detroit Tigers in Game 2 of the ALDS, and a bunch of drinks at the 500 Club, a classic Mission dive. Even better, we met up with my old buddy and fellow blogsmith Juanito, who kept buying me drinks well after my liver had informed me that it was not having it anymore. I woke up feeling rather unwell on Sunday, but had planned ahead enough to have a bottle of Champagne waiting for me in Michelle’s fridge. The time it took us to get ready on Sunday resulted in us getting to the park too late to see Nicki Bluhm and the Gramblers, which bummed me out because they were one of the bands I had been most excited about seeing. 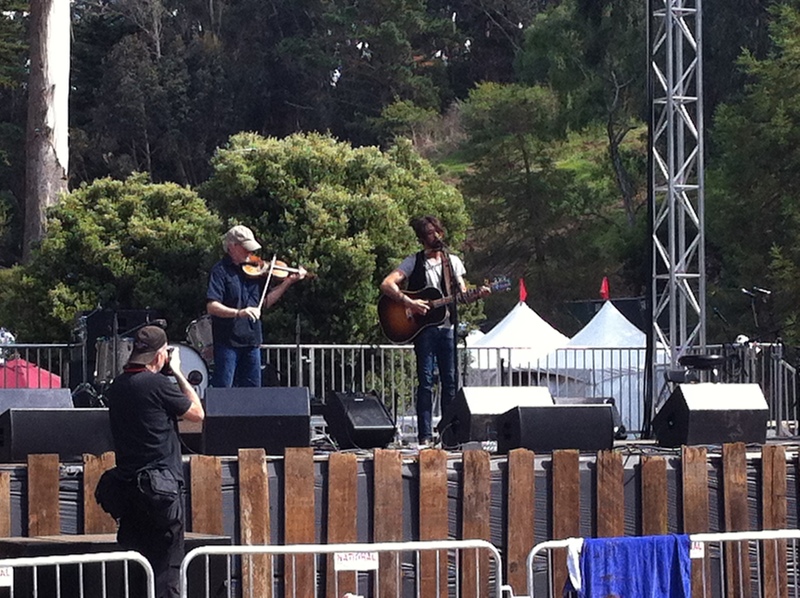 On the flipside, we got the Rooster Stage right in time for Ryan Bingham, one of my favorite artists. We were really close to Ryan Bingham. He played a great set as well, sprinkled with great songs from across his catalog: The Poet, Tell My Mother I Miss Her So, South Side of Heaven, Bread and Water. It was a near-perfect set, and the highlight of the festival for me. After Bingham, we ran to the Towers of Gold stage to see Billy Bragg, who opened with one of my favorite songs, Way Over Yonder in the Minor Key, and who uttered my favorite quote of the weekend: “Americana is country music for people who like the Smiths.” We then made our way back to the Rooster Stage in time to see Buddy Miller, who did duets with Emmylou Harris (pictured up top) and Richard Thompson, and who played another of my favorite songs, That’s How I Got to Memphis. We closed the festival by watching Emmylou perform with Rodney Crowell back at the Banjo Stage, where we also met up with my buddy Cory. It was somewhere in this general timeframe that I decided to jump a fence and ate it and totally bruised my leg. Because of course I did. 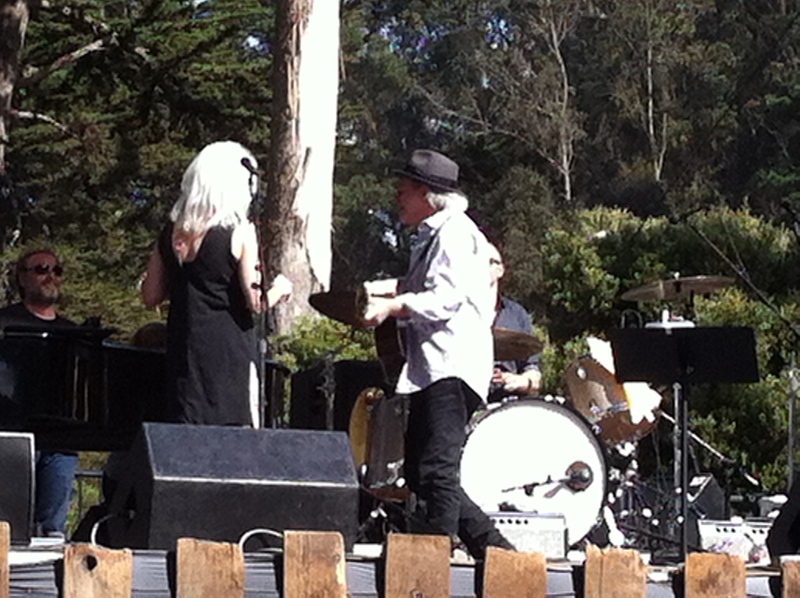 So there you have it: the blow-by-blow for Hardly Strictly Bluegrass 2013. Tonight I’ll be on a red-eye flight back to New York and real life, but I had a great time, and I’ll see y’all next year. This entry was posted in Music, Uncategorized and tagged allison krauss, billy bragg, Buddy Miller, Emmylou Harris, hardly strictly bluegrass, music, ryan bingham, San Francisco, Steve Earle. Bookmark the permalink.